This article explains the available reports and key features of the Report Center. For information on how to subscribe to email versions of the reports, visit the Knowledge Base article titled, Subscribe to Email Reports for a Dealer. Watch this short video overview of the Reports Center and/or read about each report and your options below. After clicking on the Reports tab in the Portal you will automatically see Report Center displayed. If you manage one dealership, your dealership will automatically be selected in the left column and you will see a chart to the right. 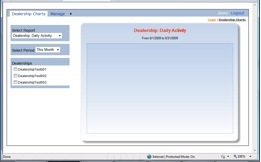 If you manage more than one dealership, no dealership will be selected and the chart to the right will be empty. 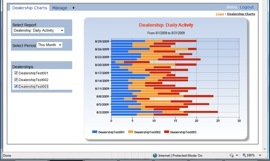 As you select dealerships, the graphical chart will display for the selected dealerships. The left panel is your Chart Selection Panel. This panel allows you to select the specific chart and options to display on the right side. The Chart Selection Panel is comprised of three parts. The Select Report option contains the current list of available reports. Simply select the report you would like to display from the drop-down list of available charts. Each of the available reports is displayed below. 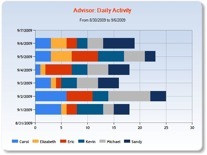 Displays a stacked bar chart with ‘daily activity’ counts. Each bar segment represents one of the dealerships you selected. Hover the mouse pointer over any bar segment to see the dealership and the actual count. 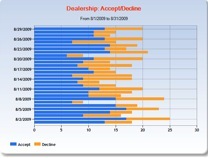 Displays a stacked bar chart with the number of total menus accepted and declined. Hover the mouse pointer over any bar segment to display the count for that segment. 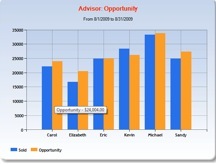 Displays a stacked bar chart with the number of menus displayed for each Advisor. Hover the mouse cursor over any bar segment to display the count for that segment. 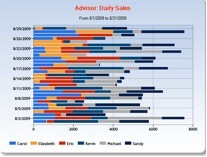 Displays a stacked bar chart with the total sales displayed for each Advisor. A ‘sale’ is considered to be any menu where the service advisor pressed the ‘Accept’ button. Hover the mouse cursor over any bar segment to display the value for that segment. 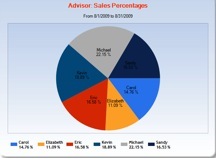 Displays a pie chart comparing the sales of each advisor to all of the other advisors. The percentage represented is the percentage of the total sales. A ‘sale’ is any menu where the advisor pressed the ‘Accept’ button. This chart only considers menus that were accepted. 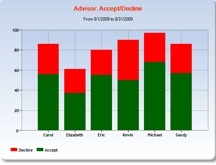 Displays a stacked bar chart with a column for each advisor, showing the number of accepted menus with the number declined menus. Hover the mouse cursor over any bar segment to see the count for that segment. This chart only displays menus that were either accepted or declined. Displays parallel bars comparing the advisors ‘opportunity’ to their actual ‘sales’. The opportunity is determined to be the initial displayed amount for the menu. ‘sales’ are the amount of the menu when the ‘accept’ button was pressed. This chart only includes menus that were accepted. 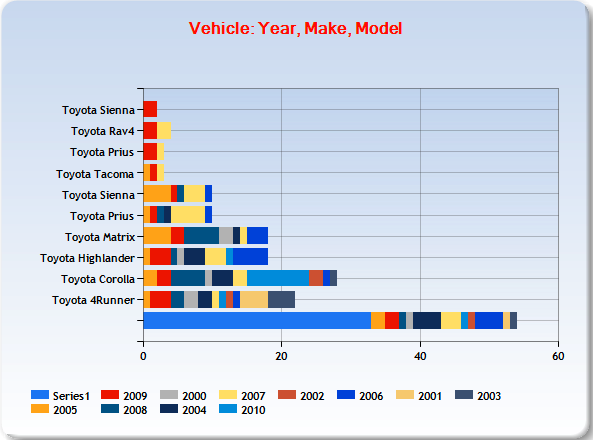 Displays a stacked bar chart of the total number of vehicles of a specific model that were presented menus. Hover the mouse cursor over any bar segment to display the count for that segment. Use ‘Select Period’ to select the date range you want to be included in the Chart. Common periods are easily selectable. Use the ‘Custom…’ option if you’d like to pick a specific date range. 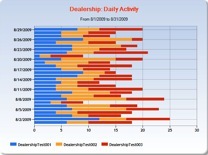 If you manage multiple dealerships, you may include multiple dealerships in the chart. Select which dealerships you wish to have included in the currently displayed chart by checking or un-checking the corresponding boxes in the lower left section. As you make changes, the chart will be updated to reflect those changes.